Background: Disagreement of strain measurements among different vendors has provided an obstacle to the clinical use of strain. A joint standardization task force between professional societies and industry was initiated to reduce intervendor variability of strain. Although feedback from this process has been used in software upgrades, little is known about the effects of efforts to improve conformity. 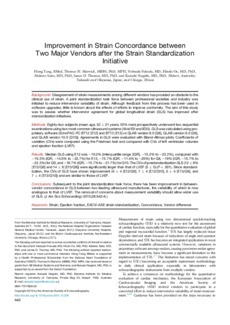 The aim of this study was to assess whether intervendor agreement for global longitudinal strain (GLS) has improved after standardization initiatives. Methods: Eighty-two subjects (mean age, 52 ± 21 years; 55% men) prospectively underwent two sequential examinations using two most common ultrasound systems (Vivid E9 and iE33). GLS was calculated using proprietary software (EchoPAC-PC BT12 [E12] and BT13 [E13] vs QLAB version 8.0 [Q8], QLAB version 9.0 [Q9], and QLAB version 10.0 [Q10]). Agreements in GLS were evaluated with Bland-Altman plots. Coefficients of variation (CVs) were compared using the Friedman test and compared with CVs of left ventricular volumes and ejection fraction (LVEF). Results: Median GLS using E12 was −19.2% (interquartile range [IQR], −15.2% to −23.2%), compared with −19.3% (IQR, −14.9% to −23.7%) for E13, −15.7% (IQR, −11.4% to −20%) for Q8, −19% (IQR, −15.7% to −22.3%) for Q9, and −18.7% (IQR, −15.7% to −21.7%) for Q10. The CVs of prestandardization GLS (12 ± 8% [E12/Q8] and 14 ± 8 [E13/Q8]) were significantly larger than that of LVEF (5 ± 5) (P < .001). Since standardization, the CVs of GLS have shown improvement (6 ± 4 [E12/Q9], 7 ± 4 [E12/Q10], 6 ± 4 [E13/Q9], and 7 ± 4 [E13/Q10]) and are similar to those of LVEF. Conclusions: Subsequent to the joint standardization task force, there has been improvement in between-vendor concordance in GLS between two leading ultrasound manufactures, the variability of which is now analogous to that of LVEF. The removal of concerns about measurement variability should allow wider use of GLS.